TeamSport London Docklands. Photo courtesy of TeamSport. Line up on the grid to tackle this thrilling 800m, multi-level circuit, reaching speeds of up to 40mph (64km/h). One of five TeamSport go-karting tracks in London, this tarmac circuit in Charlton allows you to take part as individuals or against each other in groups, as you drive the 270cc karts. Race against the clock in timed laps, or go head to head with other drivers in knockout laps or races. Following a redesign in 2018, the track can accommodate up to 20 racers. Check out the free pick-up service from North Greenwich tube station for all weekend bookings and some weekday bookings. Food and drink is available on site, including a bar, while spectators can watch the action from the sidelines. 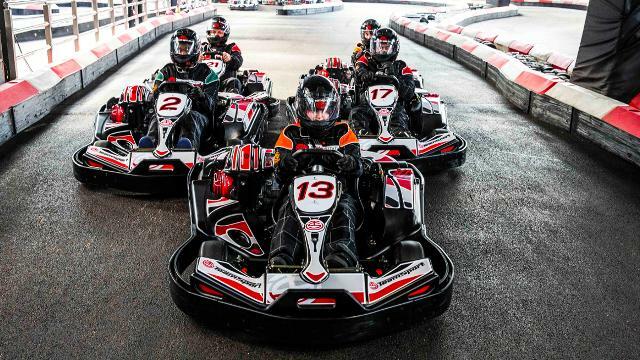 Children must be at least eight years old to drive Cadet Karts, and 13 years or older for adult karts. Children aged eight to 12 years old should have a minimum inside leg measurement of 64cm (25 inches). Adults and teenagers aged over 13 years old should have a minimum inside leg measurement of 74cm (29 inches). There is a maximum weight limit of 117kg (18.5 stone) and a maximum height limit of 1.93m (6ft 4 inches). Is TeamSport London Docklands your business?